A House committee gives unanimous approval to the so-called Facebook Fix bill, which repeals much of a current law limiting student-teacher interaction online. 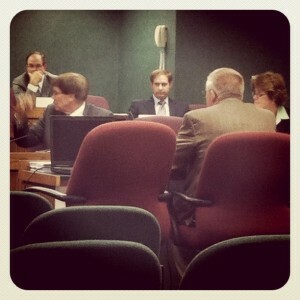 Rep. Chris Kelly (D-Columbia) presents the Facebook bill to the House Committee on Elementary and Secondary Education. A new law that restricts teachers’ communications with students online has been the center of controversy and a court case that calls the measure an infringement on the right to freedom of speech. The new bill establishes only that school districts must enact policy that governs teacher-student communications via electronic devices. Kelly says each school district will decide what works best for their community, but says he expects many will rely on policies written by the Missouri School Boards Association. The law, as it stands now, disallows teachers from using websites that give “exclusive access” to students. Kelly says he understands there are “fan” pages and “friend” pages on Facebook, “exclusive messages” can be sent through the site, but says it was not the intention of the legislature to prohibit teachers from implementing positive communication from their students. At the heart of the bill was legislators desire to prevent students from being approached sexually via electronic communication devices, i.e. computers or cellular phones. The new proposal would mandate school districts enact policies by next March to address the measure. on communications between teachers and students, including through electronic media. Kelly says the standing Facebook law could be interpreted to mean teachers couldn’t be on social media sites at all, Kelly says. “We screwed this up,” Kelly said of the law, which won unanimous legislative approval earlier this year as part of a larger education bill. Some legislators on the committee even argued that to strip teachers of electronic messaging to reach their students would mean a phone call or conversation would be the only means available, and there would be no record of those interactions… not a perfect model in its own right. Mike Wood of the Missouri State Teachers Association tells the committee that changing the law to turn power over to school districts would give teachers a voice in creating new policies. The American Civil Liberties Union and the Missouri National Education Association also testified in favor of the revised bill. No one testified against it.